The PROMO Top Shops is a searchable directory of the Top 100 U.S. promotion agencies highlighting each agency’s featured skill sets, campaigns and contact information. This online resource is a searchable database for brand marketers, marketing agencies and others looking for expert promotional agencies skilled in numerous services. PROMO Top Shops is an essential resource for consumer brands and agencies seeking experienced partners in their marketing efforts. PROMO Top Shops is compiled by Chief Marketer’s editors and also appears in print in the fall Super Book. Click here to enter the Chief Marketer 200 2018 Call for Applications (formerly PROMO Top Shops), now open through September 29, 2017. Click below to view the 2017 PROMO Top Shops. 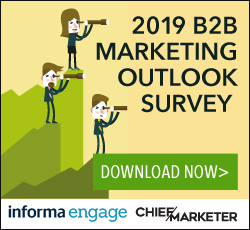 The B2B Top Shops is Chief Marketer’s searchable directory of the best and brightest business-to-business marketing agencies, both big and small. B2B Top Shops is an essential resource for B2B brands and agencies seeking experienced partners in their marketing efforts.The B2B Top Shops is a searchable listings where you’ll find each agency’s skills, recent campaigns, contact information and more. B2B Top Shops is compiled by Chief Marketer’s editors and also appears in print in the fall Super Book. Click here to enter the Chief Marketer 200 2018 Call for Applications (formerly B2B Top Shops), now open through Sept. 29, 2017.